The picture above shows the anatomy of an application that uses the Kafka Streams library. Let’s walk through some details. An application’s processor topology is scaled by breaking it into multiple tasks. 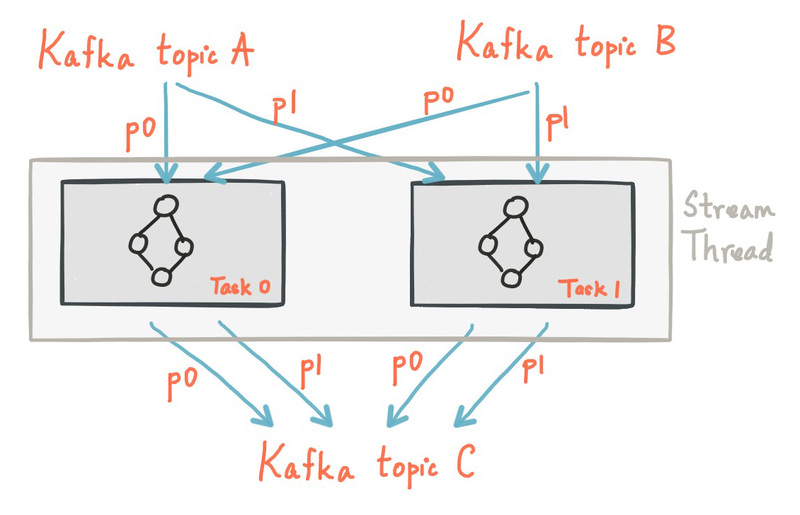 More specifically, Kafka Streams creates a fixed number of tasks based on the input stream partitions for the application, with each task assigned a list of partitions from the input streams (i.e., Kafka topics). The assignment of partitions to tasks never changes so that each task is a fixed unit of parallelism of the application. Tasks can then instantiate their own processor topology based on the assigned partitions; they also maintain a buffer for each of its assigned partitions and process messages one-at-a-time from these record buffers. As a result stream tasks can be processed independently and in parallel without manual intervention. Kafka Streams allows the user to configure the number of threads that the library can use to parallelize processing within an application instance. 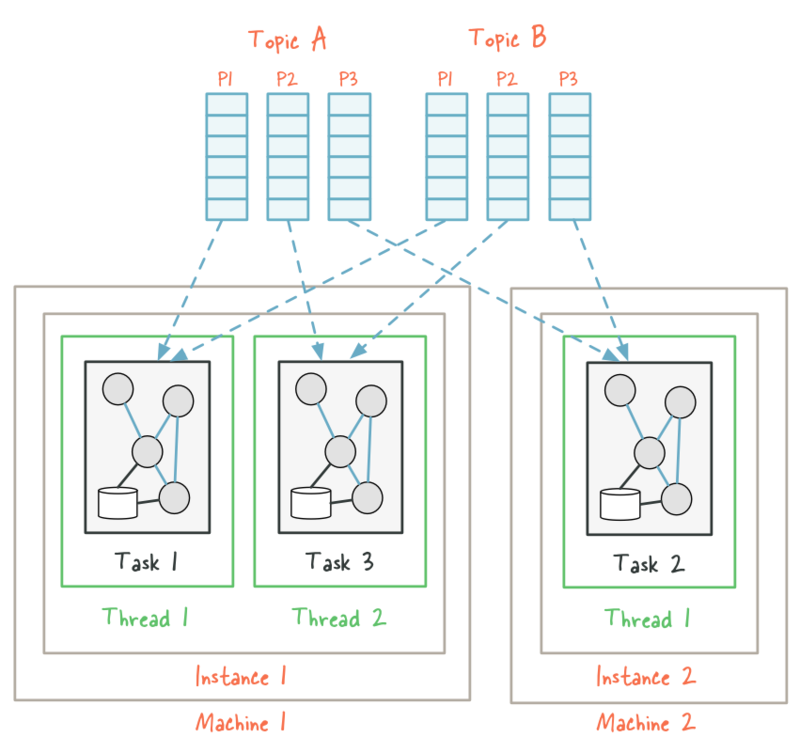 Each thread can execute one or more tasks with their processor topologies independently. 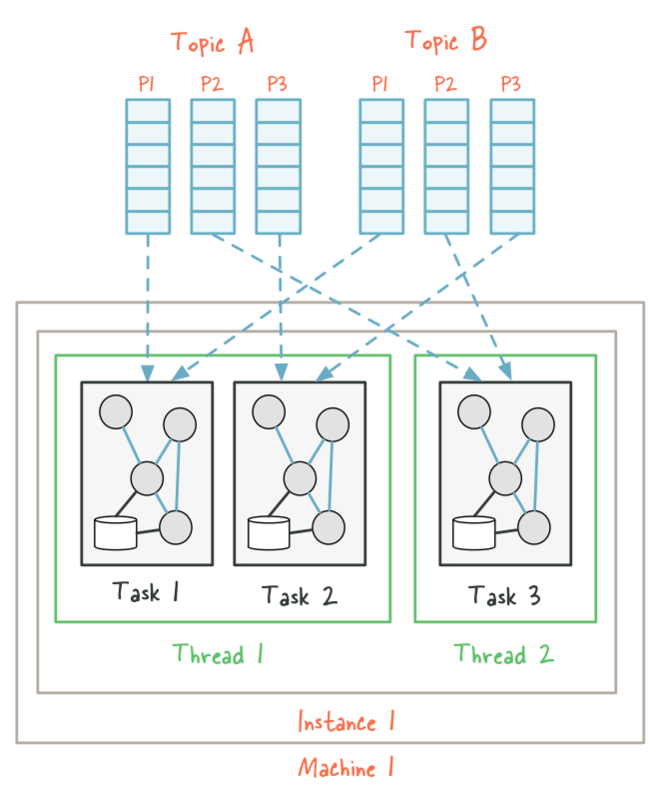 When the re-assignment occurs, some partitions – and hence their corresponding tasks including any local state stores – will be “migrated” from the existing threads to the newly added threads (here: from instance1-thread1 on the first machine to instance2-thread1 on the second machine). 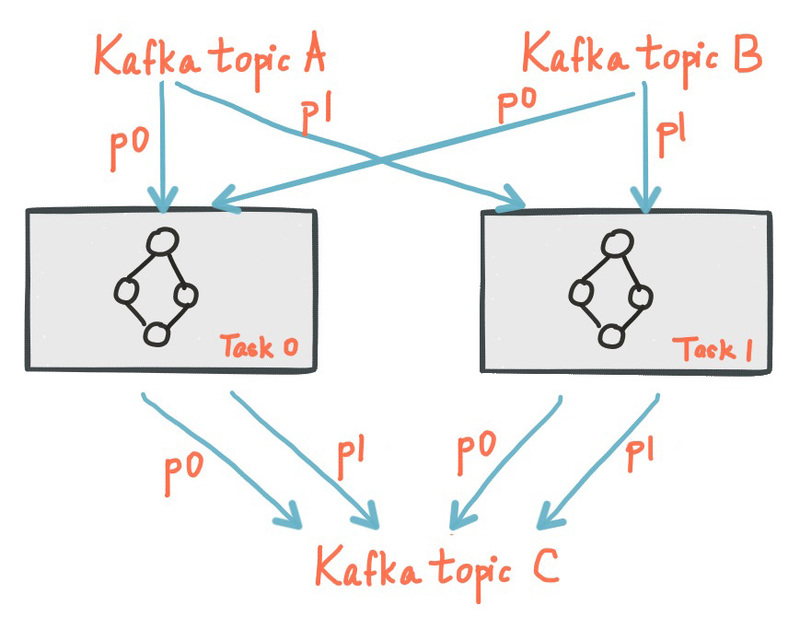 As a result, Kafka Streams has effectively rebalanced the workload among instances of the application at the granularity of Kafka topic partitions. 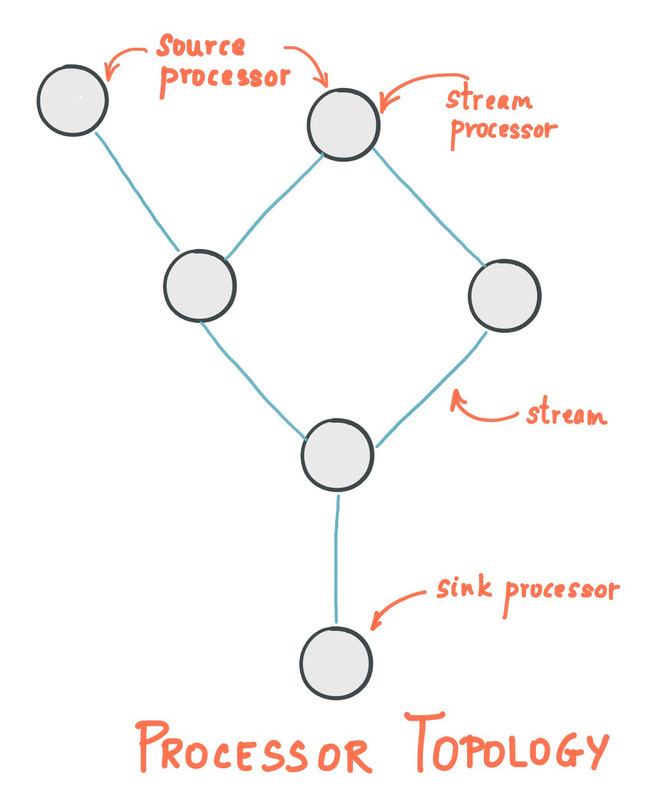 Kafka Streams provides so-called state stores, which can be used by stream processing applications to store and query data, which is an important capability when implementing stateful operations. Every task in Kafka Streams embeds one or more state stores that can be accessed via APIs to store and query data required for processing. These state stores can either be a RocksDB database, an in-memory hash map, or another convenient data structure. 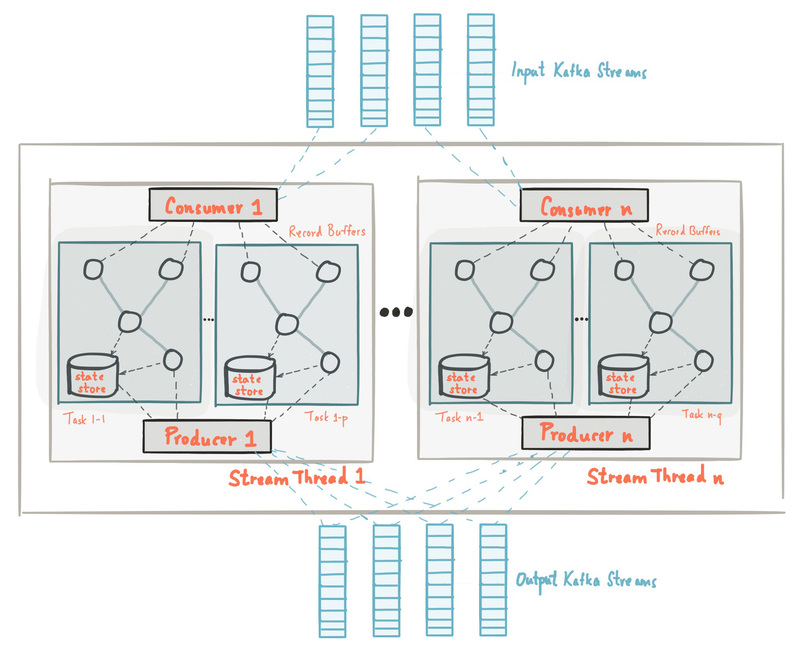 Kafka Streams offers fault-tolerance and automatic recovery for local state stores. In addition, Kafka Streams makes sure that the local state stores are robust to failures, too. It follows a similar approach as Apache Samza and, for each state store, maintains a replicated changelog Kafka topic in which it tracks any state updates. These changelog topics are partitioned as well so that each local state store instance, and hence the task accessing the store, has its own dedicated changelog topic partition. Log compaction is enabled on the changelog topics so that old data can be purged safely to prevent the topics from growing indefinitely. 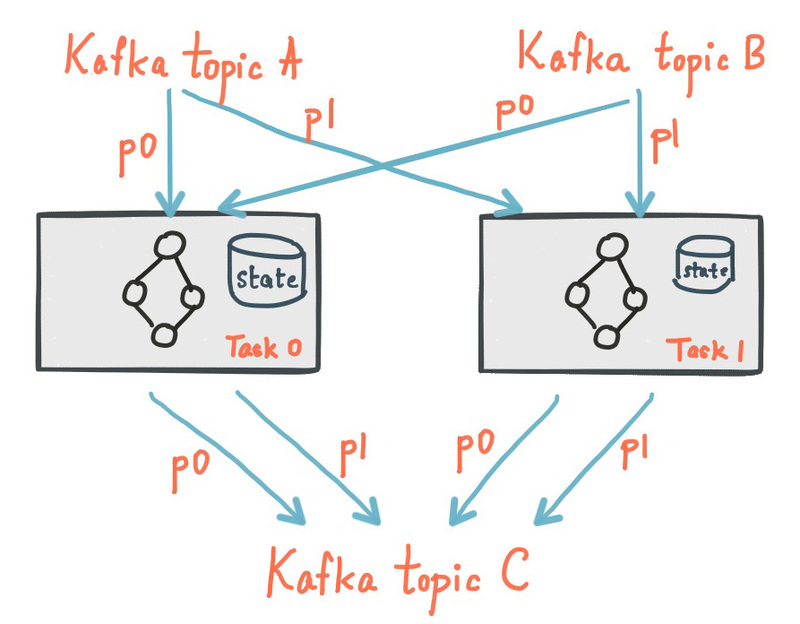 If tasks run on a machine that fails and are restarted on another machine, Kafka Streams guarantees to restore their associated state stores to the content before the failure by replaying the corresponding changelog topics prior to resuming the processing on the newly started tasks. As a result, failure handling is completely transparent to the end user. Optimization: In order to minimize the time for the state restoration and hence the cost of task (re)initialization, users can configure their applications to have shadow copies of local states. When a task migration happens, Kafka Streams then attempts to assign a task to where a standby replica exists in order to minimize the task initialization cost. See setting num.standby.replicas at Optional configuration parameters in the Developer Guide.